There are thousands of coffee shops in Brooklyn, but there’s never been one quite like Bed-Stuy’s Domicile. Founded and run by the wife and husband duo of Brianne McCabe and Danieu Johnson, Domicile serves the best in locally-sourced snacks and drinks, all made with plenty of love and no preservatives. But it’s much more than that. 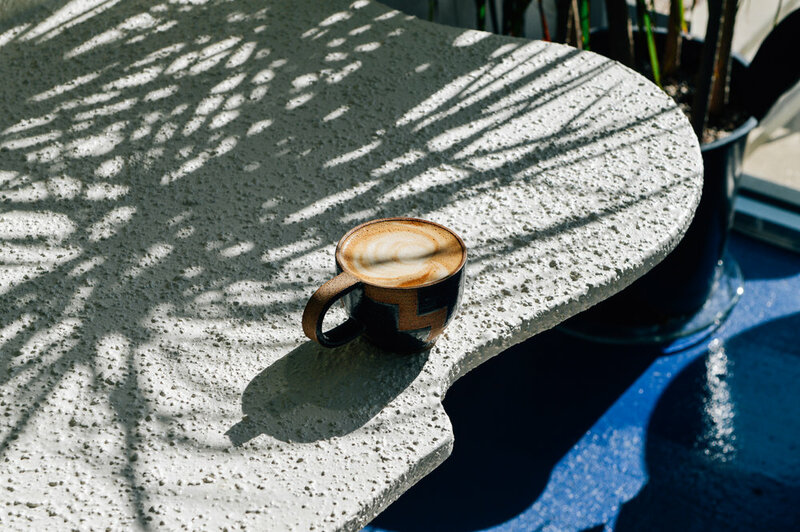 Domicile is also an art project unto itself, the space perfectly fitted with textured, custom-made furniture, as well as ceramics, paintings, and planters created by local artists. And most of it is for sale, with Domicile providing a platform for local artists to promote and sell their goods right alongside the shop’s excellent, unique coffees and teas. This month, O.N.S traveled to Bed-Stuy to talk coffee, creativity, and sustainability with Brianne and Danieu, who inspired us all with their unique ideas and honest passion for the shop. Before opening Domicile, you were both working in completely different careers, with Brianne being a designer and Danieu a technician. What brought you together for such a big project that’s not related to your previous professions? The simple answer to that question is love [laughs]! We love being creative with our hands. When we met, we were chatting about our interests, including environmental and economical sustainability, and we aligned on our shared enjoyment of working with our hands. We both grew up in households where our parents struggled financially and could never really afford quality furniture, appliances, or kitchenwares. Those experiences sparked our interest in rescuing and refurbishing found pieces or designing our own pieces entirely from natural, safe materials. Brianne mentioned during our shoot that she wanted to create something tangible that she could do with Danieu for a very long time. Why did you choose a café instead of a boutique or perhaps some kind of studio? Our intentions were to provide, not to burden. As our city continues to grow in population and develop, many of the “mom and pop shops” and small, family-owned businesses that were the lifeblood of New York City have been replaced. There are still small businesses in the boroughs but they’ve evolved into a “new standard,” with similar aesthetics and goods. In most of those cases, the prices go way up, but the quality remains the same. Coffee shops are one of these “problem children” that are popping up all around us and simply need some rehabilitation on top of a fresh perspective. You primarily carry beverages and pastries that are healthy and wholesome. Why did you choose this particular focus? In an attempt to reduce food waste, we always had the intention of buying local goods in small batches to sell at Domicile. After a ton of research and cost comparisons, we unanimously decided that it’s unethical for us to serve our customers edibles that contain preservatives and processed ingredients when we could be offering locally-sourced, freshly-grown or baked goods containing fewer preservatives. This way, we also get to support other small businesses in addition to reducing waste. Domicile is aesthetically beautiful inside and out. What was your overall concept when designing the shop and its storefront? Brianne really wanted to create a space that is both welcoming and calming. Her childhood spent on the beaches of the North Shore of Long Island inspired the look of Domicile, as did a memorable family vacation to Maui. When Danieu came into the picture, he lent his own inspiration based on a solo trip he made to Italy. The store’s design and your collaborators are noticeable everywhere in the café. Why did you decide to create and carry products made by other creative people in New York City, even down to the chai you use? Our mission is to endorse and support direct-trade goods and services via our local resources, so we’ve engineered Domicile to act as a platform for these emerging designers and chefs. Over the years, we’ve learned that there is strength in unity. With the right research and education, Domicile and other small businesses can start practicing more ecological and economical commerce methods that support a cleaner, greener future. The music at Domicile always seems to complement the concept and look of the space. Danieu even said he gets upset when the customers try to change the playlist! Why do you think it’s so crucial to pick the right music for the ambience of Domicile? [Laughs] He gets upset when our friends and employees change the music, but it really does set the tone for Domicile. We consider the music a major part of our full sensory experience when visiting Domicile, aside from the aromatic beverages, tasty foods, and visually appealing, textured furnishings. We wanted to create an environment that is not only inviting to people from all walks of life but that is also mentally and emotionally elevating. So many coffee shops are noisy, boisterous, and fast—we’ve designed and curated a space that helps those to slow down in our playful oasis. Brianne said that she wants to provide a space that locals could flock to as their “neighborhood spot.” What do you think Domicile has provided to the community to accomplish this goal? Domicile offers a comfortable lounge-like environment, affordable, quality snacks, and specialty beverages to their guests while also offering a brick-and-mortar storefront and digital platform for local designers to showcase and sell their work. Domicile also seems to be a big hit with the influencer crowd. How did you react when you started seeing so many Instagram-lovers coming to Domicile and pushing it on social media? We love it! In fact, we encourage it! The space was designed with all things creative in mind and we love that people naturally take the opportunity to snap a few photos of their beverages, the artwork, and themselves or their friends within the space. Out of all of the places you could have opened a café, why were you drawn to Bed-Stuy? Bed-Stuy is our home and has been for years. We’ve noticed the neighborhood changing over time, but some of the new shops and boutiques still feel out of place. We wanted to open a small business that brought something new to the area while also complementing the existing neighborhood. What does the word “Domicile” mean to you? What made it resonate so well with your concept for the café? Domicile is a dwelling place—a place one can call their home away from home in this dense urban environment. In our experience, Domicile is a literal home away from home. We spend every day here! Seriously though, we find the word meaningful as well as fun to say, which goes along with our delicate balance of sophistication and playfulness within all aspects of the space. Being that you love to work with others in the creative field, do you have any fun and exciting projects coming up for the summer? We do! But we’re not quite ready to announce them. We are working with a few of our designers on a batch of new products to be featured within the space, while keeping the shop’s functionality as a coffee lounge in mind. We’ve begun planning for our biggest project yet. And we’re most excited about it. But that’s going to require a bit more research and funding, so stay tuned!